Here&apos;s the problem: with so many things to see and do (and with several family members to accommodate) it&apos;s easy to blow your vacation budget. Did you know that many of today&apos;s hottest vacation spots routinely offer coupons? It&apos;s true. You can save on meals, amusement parks, variety shows, and just about anything else your family wants to see. But tracking these discounts down can be a hassle. You may have already discovered that many of your favorite restaurants regularly offer coupons if you&apos;re on their mailing list. That&apos;s a great way to get started, but then you have to subscribe to various lists, watch your email, and anticipate in advance where (and when) you&apos;d like to dine. Since most of these email coupons have short expiration dates, they&apos;re not really suitable for long-term planning. Another option is to badger friends and neighbors to collect coupons for you while they&apos;re visiting the Smokies. This is a good way to collect region-specific coupons that won&apos;t expire next week. Of course, if your friends love country music and you&apos;re more of a history buff, you might not get exactly what you&apos;re after. Google and other search engines are another way to track down elusive discounts. Simply search for the venue and coupon, and millions of pages will pop up. Then it&apos;s just a matter of sorting through all the results to find the best deal. You&apos;ll need to do this for every restaurant and attraction you plan to visit, though, so be sure to set aside at least a few weeks before your trip to gather all the information you need. Overwhelmed? It&apos;s easy to see why vacationers simply give up and pay full price for their trip. But it doesn&apos;t have to be that way. There really is an easier option to save on your next Smoky Mountain getaway. Now imagine a single location where you can easily print all the deals and discounts you need. No endless searching, no registering for dozens of email lists, no begging family and friends to hoard coupons for you. That&apos;s exactly what our coupon pages and coupon books have to offer. You&apos;ll quickly find a wide variety of coupons and discounts for everything from entertainment to meals to outdoor adventures. Whether you prefer to spend time outside, love history and museums, or simply want to sample a little bit of everything the Smokies have to offer, you&apos;ll find a deal that&apos;s right for you. For example, lovers of the great outdoors will discover dozens of ways to enjoy nature while traveling to Gatlinburg and Pigeon Forge. Get a bird&apos;s-eye view of the mountains from a zipline, or travel cross-country on horseback to get a feel for how your ancestors lived. If you&apos;re looking for a one-of-a-kind view though, hop aboard a helicopter for a tour of the mountains you&apos;ll never forget. Best of all, you can save big on all of these adventures with valuable coupons. Spending the day in the wilderness is a sure-fire way to work up an appetite, whether you hike the backcountry trails or hop an inflatable raft for a trip down the Little Pigeon River. Be sure to check out the many discounts available on area restaurants, to save on all your meals. Choose a familiar favorite such as Golden Corral, where you&apos;ll save up to 10% on everyone&apos;s meal, or opt for a dining experience unique to Gatlinburg and Pigeon Forge. Either way, eating out won&apos;t break the bank. No dinner is complete without dessert, so be sure to stop by one of our famous fudge shops for a free slice in your choice of flavors. There&apos;s more than enough variety to keep every sweet tooth in the family happy. Of course your trip to the Great Smoky Mountains just won&apos;t be complete without a stop by many of the local amusement parks and other attractions. 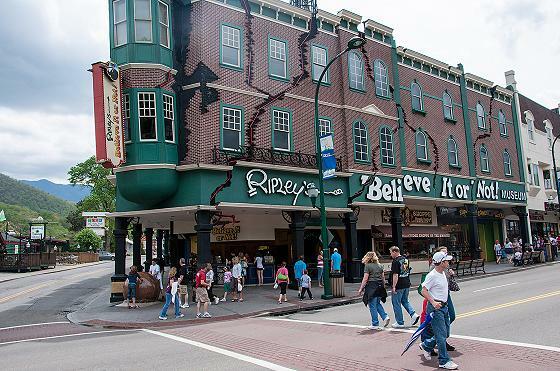 You can easily spend an entire day touring the many Ripley&apos;s museums, including Ripley&apos;s Believe It or Not!, the Aquarium of the Smokies, the Mirror Maze, and Haunted Adventure. And you&apos;ll save on admissions for the entire family.